I’m an experimental person by nature. I love to try things side-by-side to see what works best, try things over and over again, fully understand how things work, and research until I have a complete picture. I apply this tendency to many aspects of my life, including food and healthcare. In another life, I could have been happy in any number of scientific fields. So perhaps its no surprise that clinical research appeals to me. The ability to further medical science, treat my kids at the same time, and even be paid to do it (not that it pays much) makes it win-win! I’ve hinted at it from time to time, but I realized that I haven’t officially written up the Egg Allergy Study that Zax is currently enrolled in. As the study is more than half over, I’ll do it now! Allergists have long known that eating egg in its baked form (when an egg-allergic patient is able to do so) can reduce the severity of said allergy, or even speed the person in outgrowing it. For the past 18 months, Zax has been in a study looking to measure that phenomenon. 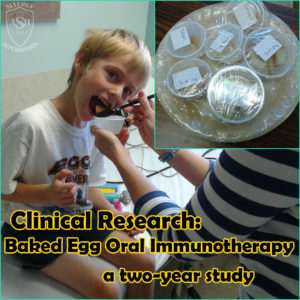 The study is comparing eating baked egg to egg oral immunotherapy (OIT) in order to compare the increase in thresholds (tolerance) and the decrease in skin/IgE reactions in both groups. 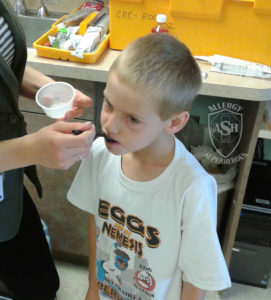 Note: Please consult with your allergist before attempting to feed baked egg products to someone with an egg allergy! 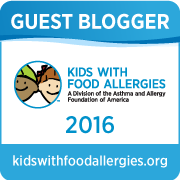 Zax’s peanut allergy is definitely more severe, but the egg allergy is more limiting. If you think there are peanuts everywhere, you should try baking, or worse yet, buying baked goods without eggs in them! I’d say the only more prevalent major allergens are dairy and soy. (And maybe wheat, but gluten-free has exploded in recent years.) I’ve learned a lot over the years about how to substitute eggs, and I don’t honestly feel that Zax is missing much, but it still would be nice for him to be able to eat a birthday cake that wasn’t made by me once in a while. Or we could go out to breakfast as a family–yes, that would be nice! In order to be eligible for the study, Zax had to be capable of eating baked egg. Originally they accepted some entrants who could not and placed them directly into the OIT path, but those slots were filled by the time we found this, so all participants had to be capable of eating baked egg–they were then randomized into either half. 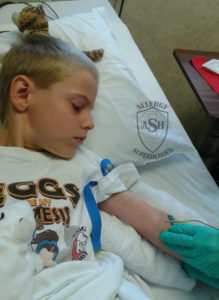 Zax had failed a baked egg challenge when he was three, but it had been three years since that happened so we did a challenge with our allergist. It was actually quite a treat to discover that he could finally tolerate baked egg! One dose seemed to be very close to his threshold, but it was still a pass and made us eligible for the study! There were a lot of office visits to get started: an initial screening (which involved both skin and blood testing and a physical) followed by four double-blind, placebo-controlled food challenges. The first two were muffins. One day was baked egg, and the other was a substitute. He had to pass both in order to advance–which he did, by the skin of his teeth. 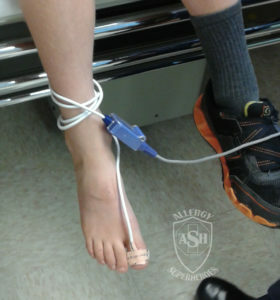 He wore a Pulse Ox meter on his toe the whole time. They checked his vitals before every dose. The nurses had all meds pre-measured and ready to go. Following that was a pair of challenges to applesauce spiked with either egg white powder or oat powder placebo. All of these challenges were still screening Zax for the study. Not only did he need to be able to tolerate baked egg to be eligible, he also needed to react to egg white powder by 1,440 milligrams or he wasn’t allergic enough for the study. During these challenges, Zax was under nearly constant supervision from the study nurses. They played with him or sat beside him as he did his own thing, but they were always paying attention. The only time he was left in peace was to go to the bathroom, although they wanted to know if he had any poop and what its consistency was if he did. They also took him around the floor for walks between every dose. This was quite the contrast to our previous study. Not that the last was negligent, but they didn’t shadow him last time. 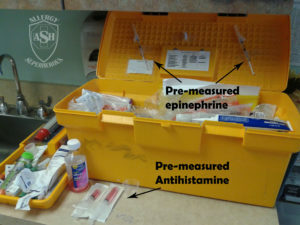 All of these challenges were very long days, as we had to stick around for two hours after completion of all doses or after any reaction that resolved with antihistamines, and 4 hours after any reaction resolved with epinephrine. Fortunately, they let him order an allergy-friendly lunch from the kitchen each day, because he was going to be very hungry otherwise. Zax remembered the food challenge room from his previous study and was pretty excited to come back to it. There were always plenty of movies to watch, toys to play with, and perhaps most importantly for him, crafts to do. We came home with a zillion new project from this study. After successfully completing all challenges, Zax was officially eligible and randomized into the baked egg half of the study. They gave us a booklet with a handful of recipes, a log to keep track of his doses, and they sent us off to dose at home. The experience reminded me somewhat of having my first baby: after a bunch of office visits one on top of the other, we were sent off to fend for ourselves. Since that time, Zax has been eating 1/3 of a baked egg nearly every day. To be honest, I hadn’t acknowledged just how much baking I would be doing for this study. It’s work, let me tell you! It hasn’t been entirely smooth sailing, especially at the beginning. As I mentioned before, 1/3 of a baked egg seemed to be right at Zax’s threshhold–he would barely start to feel symptoms at that mark, but they would quickly subside on their own. However, daily dosing seemed to have a cumulative effect, and a few days into the study he was complaining of more symptoms. The study nurses have been great through the whole study though, and never minded me calling them for suggestions or to find out what to do. Our main nurse told us that some kids need the aid of a daily antihistamine to get them over the hump, so we started using Children’s Claritin daily for a little while to ward off minor reactions. Finding things to feed my child have been problematic, too. Doses are supposed to bake for at least 30 minutes at 350 degrees or greater, but many recipes don’t meet this criteria. I’ve only been able to use a handful of the recipes from the study booklet, because my picky eater won’t touch the rest of them, so I’ve developed a lot of recipes on my own (with study approval.) There are two main problems I’ve encountered. Sometimes a recipe is promising, but a dose of 1/3 of an egg would be the size of a dinner plate, so I have to add eggs and remove other ingredients to make a dose into a reasonable-sized serving. Also, many recipes don’t bake for a full 30 minutes, so I have to make all sorts of modifications in order to make the food survive the full baking time and still be edible. And usually, I have to do both. In fact, I’m planning on publishing a cookbook for this express purpose once the whole thing is over and done with. 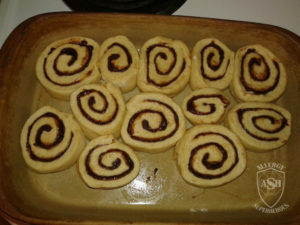 One of my first baked items–cinnamon rolls! They were HUGE once baked! And let me tell you, regularly baking with eggs has been weird. For years, we kept eggs largely out of the house. When we did have them, we would say “Dada, Mama, and Kal can eat this eggy food, but we’ve got something else for Zax.” Nowadays I often say, “Nobody eat this eggy food but Zax!!! I don’t want to have to bake again too soon!” Which is a Very. Bizarre. Reversal. The initial reactions did make Zax wary of continuing for a while. It wasn’t uncommon for him to complain about eating his doses, and he would sometimes tell me he wants to keep his allergies, or he’d throw Kyle Dine lyrics at me: “FOOD ALLERGIES ROCK!” Zax has grown up in a household where food allergies are the norm, so he hasn’t felt left out as often as a child whose family is new to this might have–and I don’t think he grasps the whole “death” part of it yet. We’ve worked through it though, and I have to admit, this kid is a trouper! Despite the occasional protest, complaint, or reaction (and once in a while telling me that the recipe I developed is entirely inedible–to my picky child, I don’t think any have been completely inedible) not to mention regular prick tests, blood draws, and food challenges, he has continued participating and understands his responsibility in this process. It makes a Mama very proud! After about a month, we were able to stop using the daily antihistamine, which I’m glad about. I prefer for us to be as unmedicated as possible–plus, I’m wary of daily antihistamine use with food allergies for personal reasons (and if a Daily can prevent minor food reactions for the purposes of this study, that seems to be verification of my suspicions in my mind.) Zax still suffered from the occasional, random reaction (thankfully, all minor.) Sometimes this happened if doses were too close together: dessert dose after a late dinner, followed by an early morning breakfast dose equals missing an hour of school while waiting for the reaction to subside. Sometimes it happened if a dose was underdone: which would sometimes happen when I tried a new recipe. And once, a reaction happened after he licked some raw bread dough. I was prepared for this eventuality with sweet batters, like for muffins, but I hadn’t expected him to do it to bread dough, so I didn’t warn him in advance and wasn’t able to stop him. Zax also started experiencing symptoms regularly last March, and that concerned me at first. It seemed to coincide with a couple of new recipes which had been underdone, and I was concerned that I’d somehow sabotaged his immune system. The study nurses reassured me that no, I hadn’t done anything, and together we realized that it was the start of pollen season and so his immune system was getting overloaded. Starting him back on daily antihistamines helped, and we were also able to avoid reactions by splitting his dose in half throughout the day. 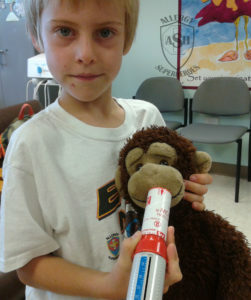 This particularly came in handy when we had to stop antihistamines for allergy testing. Zax’s tolerance has definitely grown, and I’m hopeful that we won’t need the daily antihistamine this spring. How do I know his tolerance has improved? Well, last summer, at the one-year mark for the study, we went back in for more double-blind, placebo-controlled food challenges. We didn’t have to challenge baked egg again, as he’d been eating those daily for a year. However, they wanted to see how much improvement the therapy had done, so once again we challenged egg white powder (or oat powder placebo) mixed into applesauce. And improve, he did! By how much? Well, here’s a comparison. The previous year, Zax had to react by 1,444mg cumulative egg white powder in order to be eligible for the study. At the one year mark, he could go as high as 7,444mg (that was the amount consumed if he ate every dose without reacting.) For reference, an egg is 6-7 grams (6,000-7,000mg.) For purposes of this study, they considered 6,000mg a full egg. For the purposes of the study, Zax also had to exhibit objective symptoms before they could call a challenge quits. Subjective symptoms are those that are felt by the patient, but that nobody can see any signs of. 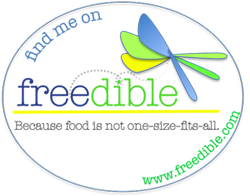 Objective symptoms are those that are outwardly visible. Very often, people feel subjective symptoms first, but study challenges have to continue for objective symptoms–this is to make sure that the patient doesn’t think they’re reacting out of nerves or placebo effect. Of course, in a real-life situation, we stop eating and treat (or at least, monitor) a reaction at the first subjective complaint. At his screening challenge, Zax could feel subjective symptoms at 44mg of cumulative egg dosing: itchy mouth/throat, plus he got all quiet and snuggly. (The previous study we did, with a different dosing schedule, actually had him feeling subjective symptoms at about 21mg.) Then they called it quits at 144mg for what they called “Change in Affect.” What that meant was that there was still no visible swelling or hives, no change in his vitals, but anybody looking at him could see that he’d gone from a rambunctious, energetic kid to one who wanted to curl up into a ball. At his one-year challenge, Zax made it to 144mg before reporting an itchy/painful throat. These throat ailments continued for the next several doses, peaking a few minutes after a dose but always waning before it was time for another. His energy level remained high throughout, and he had no visible symptoms and his vitals remained steady. 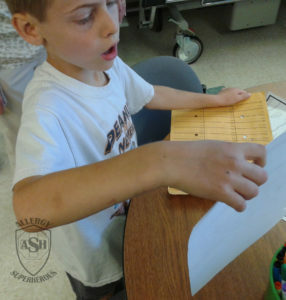 Because of the consistent symptoms, the nurse seemed sure that something objective would appear at any moment, and she slowed down the dosing a little and even started giving him doses 1/2 at a time, but this pattern continued. As we got farther into the challenge the doses got bigger though, and after he reached about 2,944mg cumulative (nearly half a egg!!) 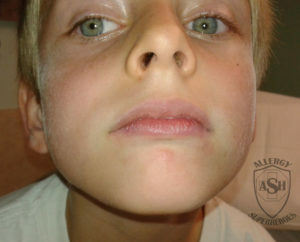 he got a couple of hives and a swollen lip, and we ended the challenge. Then about an hour after dosing was completed, he got a stomachache that lasted for about an hour. 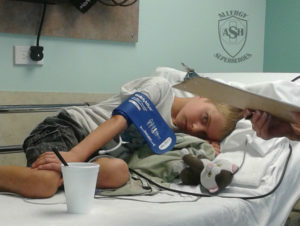 He tolerated a lot more, but once he started reacting, the greater dose seemed to also take a greater toll on his body. Opening the envelope to see which day was which. We knew, of course, but only the kitchen knew for sure until we opened this. Even so, this was a HUGE difference! We’re still avoiding egg in his diet except for his doses (and we’re required to for the study) but we are not particularly worried about cross contamination anymore. (I still don’t want him eating bacon cooked on a griddle with fried eggs, but just about any other form of cross contamination probably won’t carry enough egg to bother him.) And that is such a wonderful improvement in our lives! We’ve got about five more months of daily dosing to go, and then he’ll do another pair of double-blind, placebo-controlled food challenges. I’m hopeful that we’ll see an even greater increase in his tolerance. After that will come the scary part. We’ll be expected to stop daily dosing for 2 or 3 months before returning for one final pair of challenges to see if he’s experienced “sustained unresponsiveness.” That means they’ll see if he loses any tolerance if he stops dosing. 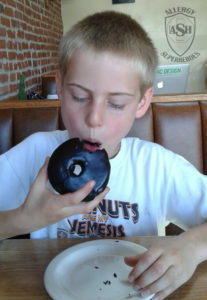 This is scary because I don’t want these two years of cajoling my reluctant child into eating every dose, baking even when I’m out of time, finding ways to incorporate these sometimes-large portions into his daily diet, and watching him react when things didn’t go right to have been for nothing. It would be horrible if his tolerance gets reset to the beginning. I believe that going that far backwards is unlikely, but I still don’t want to lose what we’ve gained. When thinking about these possible risks, I have to remind myself that this isn’t just for my child. 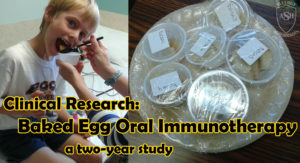 We joined this study for personal benefit but also to help others with egg allergies. It’s important to know if a lengthy hiatus from eating baked eggs will set the patient backwards, or if it’s okay to stop for a while. Because in real life, it’s hard to stick to a daily regimen, so we need to know just how strict we need to be with our kids’ special diets. 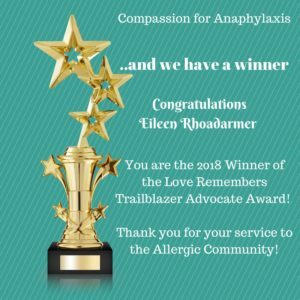 As I said before, I’m an experimental person, and I’ve now had the opportunity for my family to participate in experiments that will help many allergic people. It can be scary, but it’s also exciting! 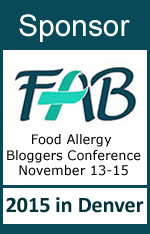 There were no food allergy therapies when I was a kid, so this is amazing territory we’re forging into! Disclaimer: Please remember that I’m not a doctor, no matter how experimental I may be. Please don’t feed baked egg products to your egg-allergic child without first consulting your allergist! Next → Next post: Daiya Foods and Dairy Free GIVEAWAY! This is so interesting to read about! I hope my egg allergic guy gets there someday. Happy to hear about your experience. Thanks for sharing! Thanks Danielle! For a long while, I didn’t think we’d ever reach this point, but it was a treat to discover that it had happened! I hope your little one reaches that point! For dairy, too! I don’t know why I never replied to this, sorry about that. Glad to have helped, thanks! Thank you for this post. We are currently attempting to introduce baked egg with my son as well but I am having a really hard time finding recipes that will work for the parameters that have been set for us. We are currently dosing with 1/4 egg baked into a product (also at 350 degrees for at least 30 minutes). I have only found one chocolate cupcake recipe that has worked but I would love to have another option. Would you be willing to share a recipe that you all liked? It’s incredibly frustrating to search for recipes that seem to not exist! lol.